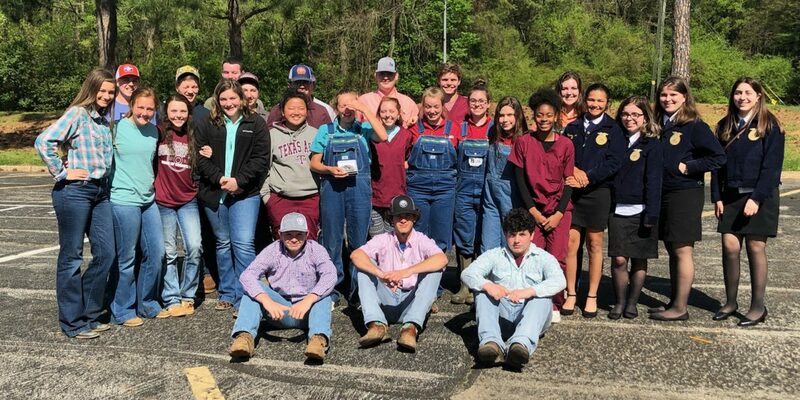 NACOGDOCHES – The Grapeland FFA participated in the SFA (Stephen F. Austin State University) Invitational judging in Nacogdoches. This was the largest contest that SFA has ever had with over 3,300 participates in the 13 different competitions. Grapeland had teams in seven different contests including: Forage Evaluation; Livestock Evaluation; Farm Business Management; Veterinary Techniques; Horse Evaluation; Homesite Evaluation; and Land Evaluation. The Forage Evaluation team placed 11th overall with team members: Spencer Martin; Bryan Perez; Cole Goolsby; Dayne Brazzill; and Chanellor Francis. Livestock team members were: Jack Woodford; Eric Cutshaw; Conner Jordan; and Ethan Harrison. The Farm Business team placed 11th with team members: Cierra Espinosa; Cierra Simon; Stacy Perez, and Amy Puga. Vet Techniques team members were: Taylor Pennington; Amy Crook; Keaundra Harris; and Gavin French. Horse Evaluation team members were: Jessi Cunningham; Paige Mullen; Keegan Harrison; and Kloe Coleman. The Homesite Evaluation team placed first with Mary Jane Watson placing as the first high individual and winning a belt buckle. Alyssa Dilli was sixth high and JD Martin was the 12th high individual. The Land Evaluation team placed second with Cayden LeBlanc as the fourth high individual. Other team members were Preslie Reynolds, and Maddy McCombs. The team will compete at the Area contest at SHSU on April 16 for the right to advance to State.